“Where can I get rosary beads?” is a common question asked by almost all people who look for the best, durable and exquisite rosary beads for prayer purpose or sharing as gifts. If you are also facing the same question and looking for an effective solution, then HolyLand-Gifts.com is the right answer where you get everything of your choice and interest. 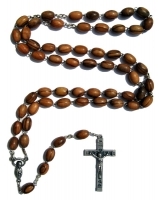 We know the utility and importance of rosary beads for prayers and other religious occasions. That is why we deal in the selling and supplying to a wide and exhaustive assortment of selective and fine quality rosary beads that give your religiousness new heights and dimensions. You feel a great relaxation and comfort when you get these beautiful beads in your hands and associate yourself with almighty in a different manner. Whether you’re looking for a rosary beads necklace or mother of pearl necklace, HolyLand-Gifts.com gives you affordable solutions suiting your specific needs and wants.